E-Commerce, M-Commerce, and Now TV-Commerce? Today's customers are empowered by technology and they can practically go anywhere to find what they want. As connectivity and Internet speeds increase across the globe, there emerge huge opportunities for merchants of all sizes to do business over the web. The rapid development of mobile technologies has enriched the notion of e-commerce and expanded the 'place' of purchase and revenue streams for merchants. Consumers can now shop and pay not only in a shop, but also at home, work, on the bus, and on the hoof. The smartphone and m-commerce have in that manner blurred the limits between the on- and offline worlds. Time has become an extremely valuable commodity, and to a considerable degree defines the choice of products, services and retailers. Convenience is another significant factor for consumers. Experts say that TV commerce (or t-commerce) is an area for the new smarter shopping and a path for merchants to engage with consumers in new ways. 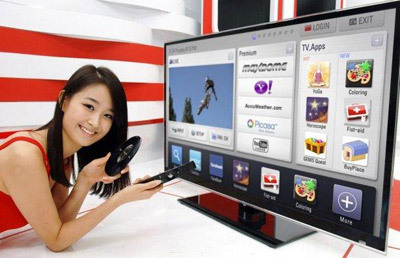 Connected TVs or smart TVs, which have functions such as connection to the Internet and streaming, are becoming standard among TV brands. According to some industry sources, the penetration rate of connected TVs was 20% in 2010, and will increase up to 50% in 2013. In addition to that, such platforms as Google TV, Apple TV, and Roku for viewing video on demand (VOD) are getting increasingly popular. Television is therefore entering an entirely new era, bringing more opportunities for advertising, marketing, revenue generation, and viewer participation. What are the key features of t-commerce? Making purchases. T-commerce solutions allow TV-viewers to respond directly to offers delivered on the screens of their TVs, and instantly purchase products by using their existing remote controls and set-top boxes. Request for information. T-commerce apps enable TV viewers to request more information on products, services or events directly from the content they are watching on the television with a few simple clicks on the remote control. Voting and polling. T-commerce solutions provide additional opportunities for the viewer to interact with programs, advertisers, and networks. Thus, viewers can vote on their favorite shows, programs, news reports, game shows, sporting events, etc. The immediate response. The instant feedback from the viewer means immediate response for the merchant. Businesses gain thereby valuable customer data for further research and targeted marketing. The paradigm of t-commerce has the potential to change TV sets into a powerful business tool enabling merchants to conduct business over television. T-commerce makes it possible to reach new and existing customers through increasingly popular Internet-connected TVs and set-top boxes. The entire shopping can be performed with nothing more than a series of clicks on the remote control. Consumers usually respond very positively to businesses that take the time to understand their needs and offer excellent customer service.